We are very please to be able to announce the return of our fresh pastured pork to the farm shop next month. 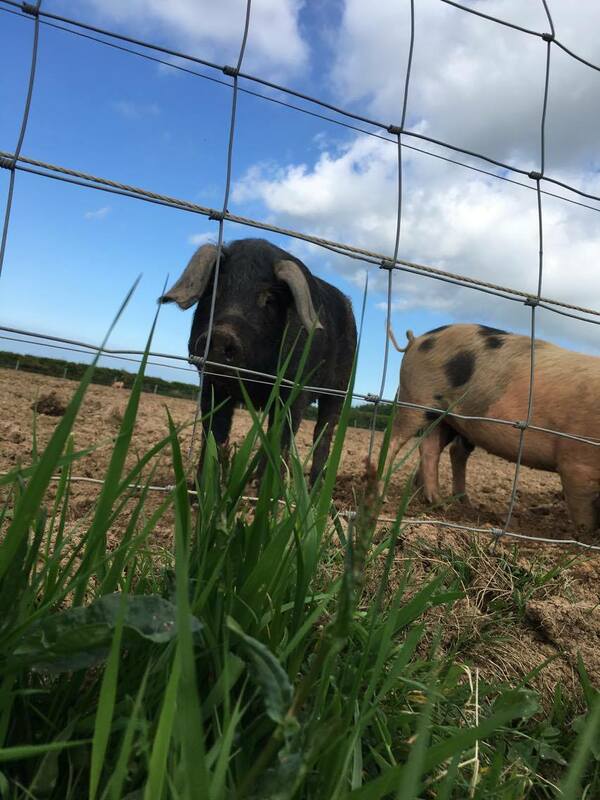 For a long time, everything we have been able to produce has gone directly to meet the demand for our charcuterie or event catering products and so fresh cuts of our delicious pork have not been available. That all changes soon, with the first batch from our new expanded herd! 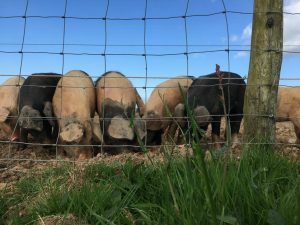 All of our pigs are raised in the way we always have here which is outdoors, on pasture, with no antibiotics or drugs of any kind and crucially no concentrated feeds. Instead, they get their minerals and medicines from deep rooted herbs and garlic and their sustenance from a broad mix of wild grown grasses and foliage as well as fresh feeds that we provide in the form of root vegetables, brassicas and fruit. This takes a lot longer than the industry standard approach, but that was never what we were all about. What it provides is a great life, a much slower, steadier growth rate, allowing the meat to develop fantastic flavour and colour to give an end product that we believe is unrivaled. 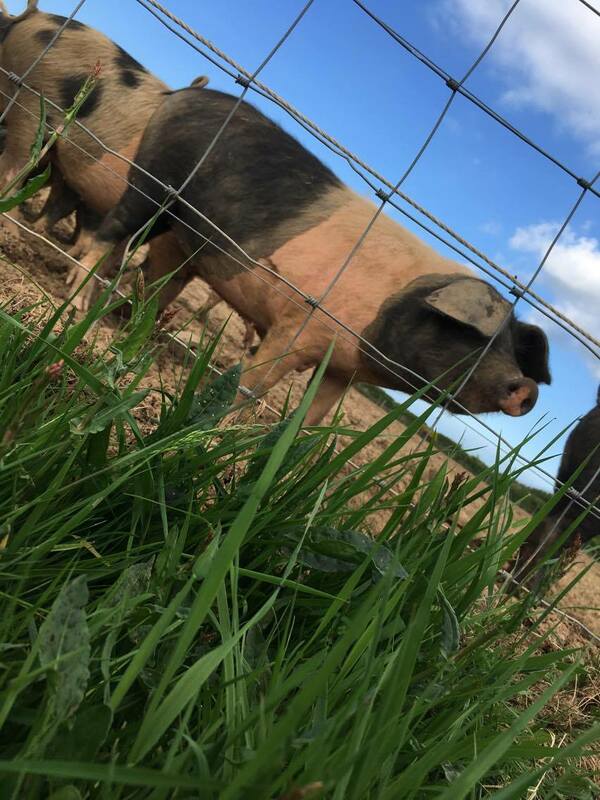 All of our pigs are crossed traditional breeds, full of vigor, character and the traits we like to see in our meat, providing a good but not excessive fat covering, darker red muscle and great crackling. All for an introductory special offer of £140, Ex next day delivery. Here is the list of contents for the new mixed monthly boxes. Each month another eight from the range will be featured. Pre-order now to ensure you get these and come with us on a tour through some sublime recipes from around the globe! All boxes contain 8 x 500g (Cost equivalent £4.44/lb) plus recipe suggestions and some history and background to each variety. Limited numbers only and all orders must be placed by the 25th of the month deadline for delivery the following week. Go to the ‘promotions’ page in the web shop to order. Our top of the range banger. Every aspect of this classic british sausage is taken up a few notches. Our great pastured pork, perfectly blended subtle spice mix and a secret treatment for the sugar and rusk make this the ultimate. Great blend of classic sweet French spicing and an array of fresh herbs make this a lively and vibrant recipe. Still the best Bratwurst we know of. 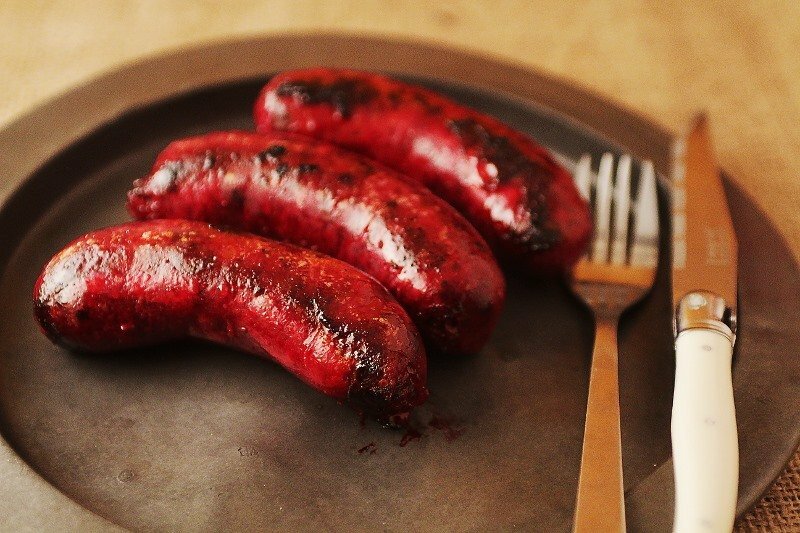 Based on a 16th century recipe but just tweaked here to create a snappy, juicy and prefectly flavoured sausage. Our fabulous Argentine style beef and bacon griller. Great powerful flavours pack a meaty punch. 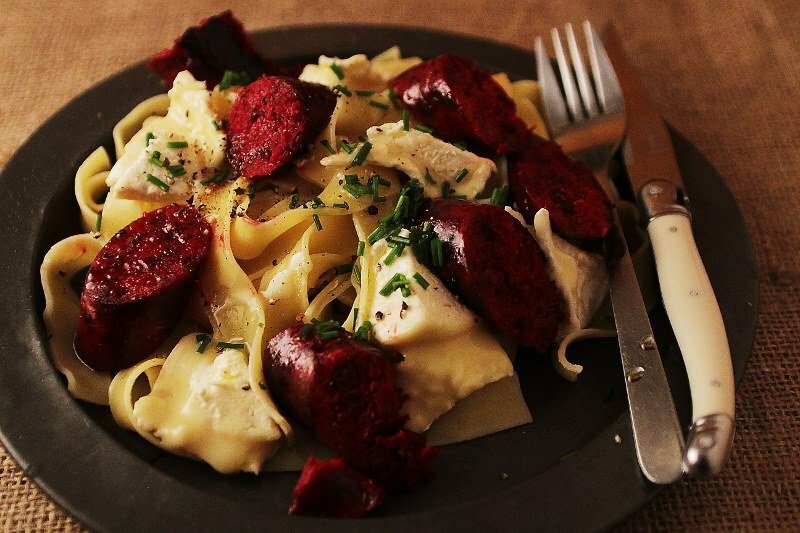 Sweet classic recipe with subtle spicing, sweet wine and cheese in a half kilo coil. Traditional Tunisian lamb sausage with warm tasty spicing ready for the grill. Trashily addictive – Our delicious recipe perfect in a soft white roll with some ranch and cold beer! One of our hidden gems. A great garlic and white wine mix that brings some class to any meal. Our range of rubs, sauces and marinades has been steadily growing this year and we are pleased to confirm that some of the small batch and limited run recipes that we have done for specific events are now being made up for retail sale and will be up on the site and, hopefully, also through our on line retail partners www.hotsmoked.co.uk very shortly. 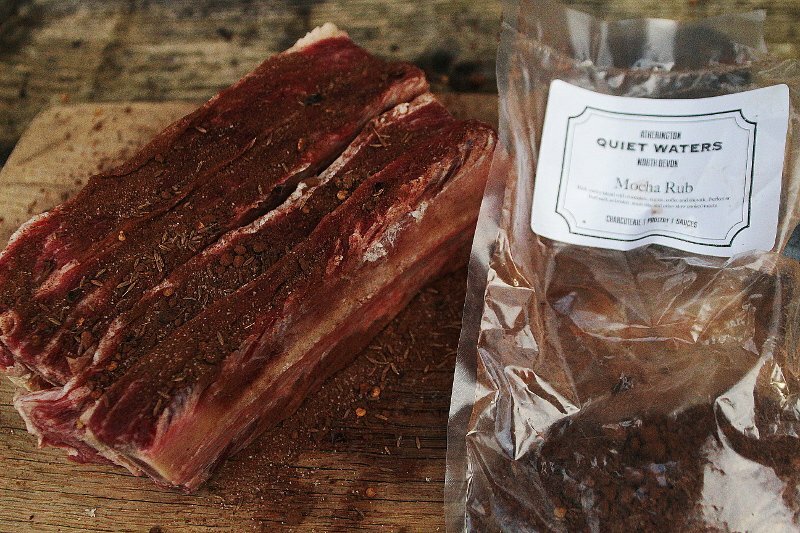 Mocha Rub: We were very pleased to work with Marcus Bawdon (www.countrywoodsmoke.com) on developing his Mocha style rub recipe for general sale. We made some tweaks which we think improved its flavour and texture and that got the big mans approval. 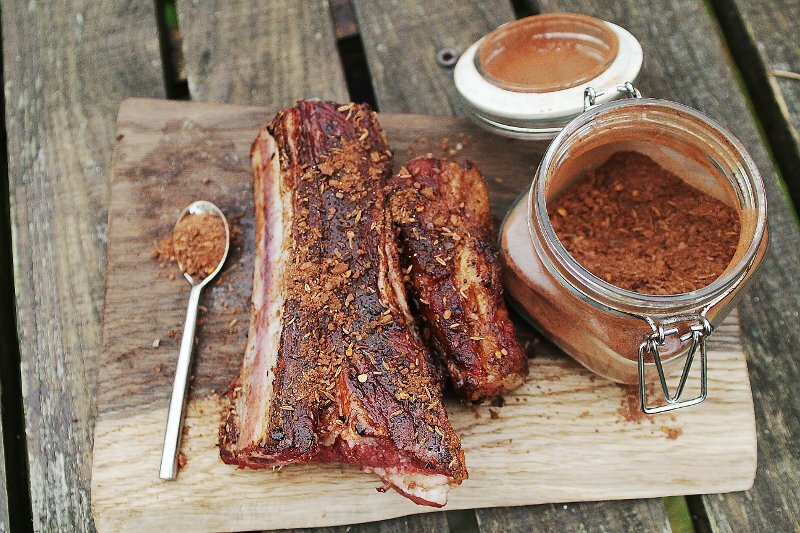 This has now become one of our own favourite beef rubs. Great on Brisket and Short Rib it brings a smoky sweetness from the chocolate, a subtle heat from the Chipotle and cracked Cumin without ever over powering the meat. Fantastic bark too, especially if you build up several light layers through the cook. Porcini Rub: This is our Umami bomb. Simple flavours that focus on really beefing up the beefiness! This rub is a great all rounder for any beef joint be it smoked, roasted or grilled. The spice mix just seasons nicely whilst the blend of other ingredients (including a blend of dried mushrooms) locks in the flavour, accentuates and improves all of those natural beef notes. Funky Porcini is available as an option and includes a nice little hit of peperoncino heat too. Grass Fed Beef Rub: So many US derived beef rubs, although often great in flavour, are most suited to the grain fed (and lets face it, drug fueled) US beef. This mix has been specifically blended to complement often leaner and more complex flavours of grass fed UK beef with its higher lactic acid and mineral (especially iron) content. The spices in this rubs interact with these qualities to highlight & intensify the natural flavours, help tenderise the lean muscle fibres and draw out the sweet notes of beef raised on our native pastures. ‘Rosbif’ Herb Rub: This is a fantastic beef rub that forms a fantastic aromatic and almost light crumb coating. Finest quality dried and coarsely ground herbs, lovely balance of garlic an pepper and then a subtle little kick of heat from a mix of smoked chillies. Great on roasts as well as BBQ for the best tasting bark around. Quiet Waters House Rub: Our ‘All Purpose House Rubs’ are finally going on sale. These are the rubs that we often use on just about everything when we cook as they act as great general seasoning mixes as well as perfect foundations other layers of bastes, glazes or sauces. These are always in the cupboard and are the ‘go to’ ingredients in our kitchen and at events. Ideal for chicken, pork, beef or pretty much anything else for that matter. Dark: This is a lovely rich mix that gives a nice dark crustiness, good hint of caramelisation and perfect all round smoky seasoning with a dash of espresso. Light: This is a great seasoning salt mix that will ensure a good crisp finish, hints of freshly ground pepper and a nice balanced sweet smokiness. All of these rubs can be used as they are sprinkled and rubbed into the meat before cooking or alternatively mixed with a little oil or prepared mustard to create a paste to be spread on the meat’s surface. As with all of our products they are made from only the finest, freshest natural ingredients, blended by us and contain no preservatives, additives, or other long named nasties commonly found in other rubs. In our view they are a great way to make good food even better. JUST A QUICK NOTE TO SAY THAT, IN ORDER TO ALLOW SOME IMPORTANT BUILDING WORK (EXPANDING OUR CURING FACILITIES!) WE ARE NOT MAKING SAUSAGES FOR A MONTH (OR CURING PRODUCTS FOR TWO MONTHS) FROM MID SEPTEMBER TO MID OCTOBER (AND MID NOVEMBER RESPECTIVELY) WHILE WE GET THE WORK DONE. TRADE ORDERS ARE UNAFFECTED. PLEASE GET IN TOUCH IF THERE IS ANYTHING YOU DESPERATELY NEED AND WE WILL DO OUR BEST TO HELP. EVERYTHING WILL BE BACK IN STOCK IN ASAP. The new Beetroot, Fennel and Pistachio Pork sausages have been a real hit, bringing an earthy sweetness and vibrant colour to the plate. Our favourite accompaniment so far has been a simple plain pasta garnished with a creamy cheese like a Chevré or a nice Chaource. The colour matches the taste, rich, vibrant and a change from teh norm. The whole fennel seed setting off the sweetness perfectly.